This book represents an authentic reproduction of the text as printed by the original publisher. While we have attempted to accurately maintain the integrity of the original work, there are sometimes problems with the original work or the micro-film from which the books were digitized. This can result in errors in reproduction. Possible imperfections include missing and blurred pages, poor pictures, markings and other reproduction issues beyond our control. Because this work is culturally important, we have made it available as part of our commitment to protecting, preserving and promoting the world's literature. ++++The below data was compiled from various identification fields in the bibliographic record of this title. 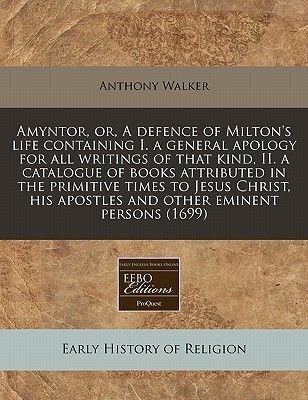 This data is provided as an additional tool in helping to insure edition identification: ++++"Amyntor, or, A defence of Milton's life containing I. a general apology for all writings of that kind, II. a catalogue of books attributed in the primitive times to Jesus Christ, his apostles and other eminent persons"Vindication of King Charles the martyr.Eikon basilike, the pourtraicture of His Sacred Maiestie in his solitude and sufferings.Toland, John, 1670-1722.Charles I, King of England, 1600-1649.Wagstaffe, Thomas, 1645-1712.First ed. Cf. NUC pre-1956.For more complete information on authorship of Eikon basilike see Almack, E. Bibliography of the King's book or Eikon basilike, 1896.Errata on p. 3]. 4], 172 p.London: Printed and are to be sold by the booksellers of London and Westminster, 1699.Arber's Term cat. / III 126Wing / T1760EnglishReproduction of the original in the Henry E. Huntington Library and Art Gallery++++This book represents an authentic reproduction of the text as printed by the original publisher. While we have attempted to accurately maintain the integrity of the original work, there are sometimes problems with the original work or the micro-film from which the books were digitized. This can result in errors in reproduction. Possible imperfections include missing and blurred pages, poor pictures, markings and other reproduction issues beyond our control. Because this work is culturally important, we have made it available as part of our commitment to protecting, preserving and promoting the world's literature.